Epoxy system formulated with highly translucent components, designed for decorative parts, river tables and jewellery where high finish is required. The very slow reactivity of Sicomin 1670 allows for casting thick sections in one operation without a change of colour. You obtain a totally water clear polymer. This system is ideal for castings from 10mm to 50mm. Anything less will result in a very long curing time. 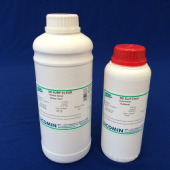 Sicomin1670 has been formulated with a built in UV filtration system which offers excellent protection in demanding applications. We have seen this system to be class leading in UV test results however for best UV protection a surface coating PU/epoxy such as TopClear or SurfClear EVO is recommended . This water clear casting system has a very unique formulation enabling excellent self degassing at room temperature. Vacuum chambers can be used for smaller intricate casting if necessary. For large resin river tables working with all materials at room temperature will help self degassing. An electric heat gun can help clear bubbles in the mix although not vital. It is important to work in an environment with low humidity and consistent temperature during curing process. S-R1670 is suitable for casting up to 50mm in one hit. For larger areas a maximum of 10kg per pour at 30-40mm seems safer. There are a range of things to factor in when casting large amounts such as; ambient temperature, how well the mould is insulated and temperature of resin. Paying attention to these parameters you will avoid the resin getting too hot causing an exothermic reaction. For large scale casting around 50mm it is advisable to cast in 2 sections, whilst the first cast is in the b stage of cure and tacky to touch then apply subsequent layers.This is typically after 15 hours at room temperature. Mix resin and hardener thoroughly paying attention to base and sides of mixing pot.If mixed incorrectly tacky spots may be present or worst case no curing at all. Work with well laid out tools and consumables in a methodical manner. This epoxy system hardens at room temperature, in order to get the full mechanical properties, a post-cure from 40 to 80°C is possible.